Proper set-up is important for efficient long lining. Brad Chappell is shown relaxing while letting his jigs do the work. With the majority of the spawning done, and water is warming up for this year, the crappie are on the move to their summer haunts. They will be moving to summer areas where they will be comfortable and have a good food source. Typically, they will move to deeper water around some type of structure, such as long points, ledges or humps, where there is a good food source. At this time of the year, the crappies are in tune to replenishing their strength and bodies from the rigors of the spawn. Generally, the newly spawned shad will be in the same general area making for ideal conditions for the crappie. 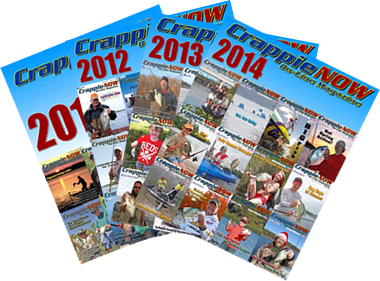 There are several different techniques to catch crappies for the above-mentioned scenario. Long lining is a technique that can fill a live well that is not very hard to do. I had the opportunity to spend an afternoon with crappie pro Brad Chappell, a long line expert who participates and is successful in various national crappie tournaments. Brad uses the long line technique 90% of the time because it is so effective in locating and catching crappie. He positions his 8 rods in the back half of the boat by starting from the center of the boat with a 9 foot Denali crappie rod, on the corner will be a 12 foot rod, then a 16 foot and finally an 18 foot pole positioned on the side near the console of the boat. This provides a fairly wide spread to cover more water. On his rods, Brad uses Johnny Morris Carbonlite casting reels filled with 6-pound test mono line. The majority of time, he will start by tying on each a 1/8-ounce Road Runner jig head rigged with a Bobby Garland Stroll’R onto each rod. Different color baits and once a color pattern is established, four to six rods will then have the effective color lure. The fish will dictate the color they most want each day. Tip: Once a body color is found, use a different colored jig head as this sometimes makes a difference in getting bites. Good electronics is critical for any open-water fishing. 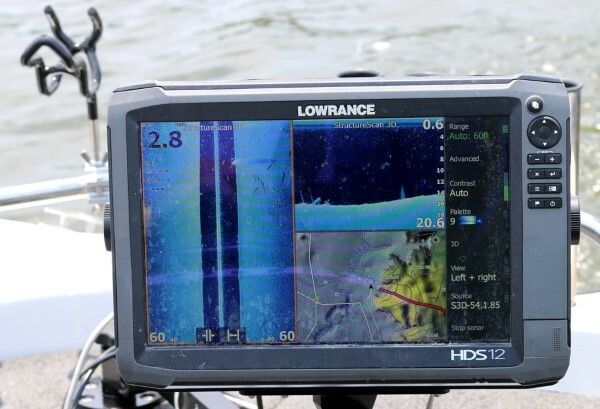 Side Imaging and Down Imaging are two good tools for finding crappie with sonar, mapping and other views also bing important. Brad typically starts with 70 feet of line from the rod tips. If the fish are deeper, then let out more line, and if they are shallower, less line. Brad normally starts pulling his offerings at one mile per hour. He will slow down if he gets bites but doesn’t hook up. Using his electronics, he will follow lake contours with his Minn Kota iPilot trolling motor, that he guides remotely, as he is facing the stern of the boat all the time monitoring his rods. The advantages of long lining are: cover a lot of water, gets the lures or baits away from the boat and it covers various depths in the water column. 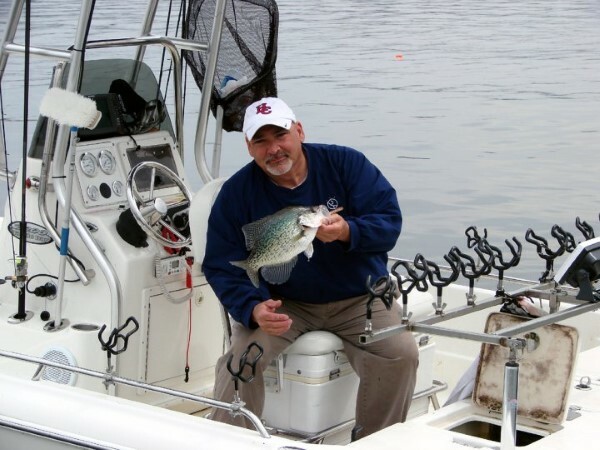 Brad owns his own crappie fishing guide service where he normally spends February through May at Eagle and Washington lakes. From late May through September, you can find him on Enid or Grenada lakes. He uses tackle from his sponsors including Bobby Garland, Denali Rods, Road Runner, Bass Pro Shops and K2 Coolers. You can contact Brad on his cell phone at 601-317-6681 or find him on Facebook at https://www.facebook.com/Bradchappell268. A couple of tips that he offers: stay consistent with jig and bodies but use various color combinations. Most importantly, be patient. Doug Muench with a nice crappie taken by long lining. Another excellent long line specialist is Doug Muench of Paris, Tennessee. 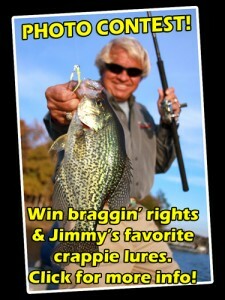 Because his home lake is Kentucky Lake, it offers an excellent playground to catch crappie using the long line method. Doug sets up his Jenko Fishing rods much like Brad with all rods facing the back of the boat. Starting at the back center of his boat will be 6- to 8-foot medium-light casting rods and then on the side of the boat he uses12-foot Jenko Fishing jigging poles. He uses 4-pound test line on all of his rods. He likes to use the shorter rods to have more control of them and to help alleviate some of the tangles when turning the boat. Tied to his rods will be Jenko Fishing 1/16-ounce jig heads rigged with various colors Mermaid bodies. He will start trolling at 0.8 miles per hour and then increase to one mile an hour if necessary. 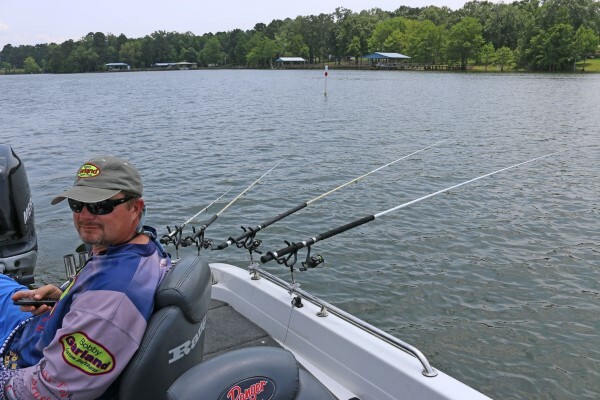 Doug, like Brad, says it is important to follow lake contours to determine the most effective depth and learn the type of structure the fish are using. He also said it is important to use both Down Scan and Side Scan on your electronics to provide the best opportunity to catch crappie. Doug’s sponsors include Jenko Fishing, Twice the Ice and Kool Well. There are some commonalities that Brad and Doug have told me that I think will help you be successful using the long line method to catch more crappie. First of all, be patient as there will be occasional tangled lines. Secondly, long lining covers more water both in width of lure presentation and water column depth giving you the chance to catch more crappie. 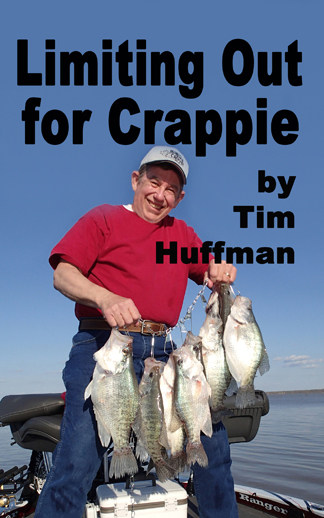 And lastly, it is an effective way to catch crappie throughout the entire year. During summer and winter, you may have to slow down to get your lure down where the fish are located. You can’t miss seeing Doug on the lake, especially at American Crappie Trail tournaments, in his 24 foot Yellow Fin white colored boat. Brad is in a 21 foot Ranger deep side boat and easily recognized by the bright white Denali rods hanging off of it. 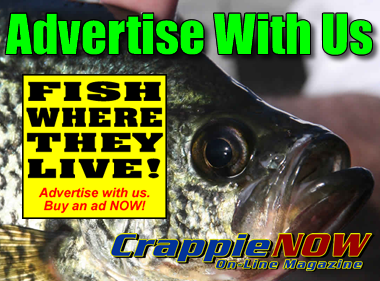 Stop and talk to either of these excellent crappie fishermen for more tips.